There's also special Fireside Brawls to take part in. 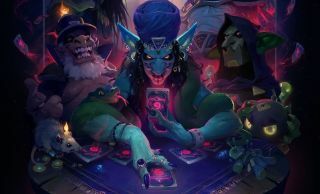 The new Hearthstone set Rise of Shadows launches next week on April 9, but you can open your new RoS card packs right now by setting up a private Fireside Gathering. The process is pretty simple, and you can do it from the comfort of your own home. Once your Fireside Gathering is active, you can participate in pre-release Fireside activities, such as opening your packs early, and special Fireside Brawls that let you construct decks with those freshly opened cards. One brawl lets you construct decks without restrictions on class type or duplicates, while the other features pre-constructed Brawl decks (also featuring new deck recipes from Rise of Shadows). The latter of those two lets you play with new cards even if you haven't bought any RoS packs. Head here to set up your own Fireside Gathering. While the instructions say to do it in a public place where people can join you, there's nothing stopping you from using your home address. Just be sure to set the Privacy setting to Unlisted, unless you want the possibility of strangers showing up at your house.